Entrepreneur and dog lover Matt Burgess wanted a site to send people to that wasn’t the replicated website all other DogGuard affiliates used. He wanted it to look good on a mobile device as well. He also wanted search engine optimization and the ability to self-publish his new content. Entrepreneur and former Lap-Band client Joe Venturelli came to me to update his website to use Wordpress, for better search engine optimization, and a cleaner look and feel. The site needed to be easy to manage and add to, without the need to hire additional web designers. Entrepreneur and Real Estate Broker Anne Kadin came to me to update her website for better search engine optimization, a cleaner look and feel and integration with her new IDX vendor that would allow displaying the MLS listings in her area. The site needed to be easy to manage and add to, without the need to hire additional web designers. Entrepreneur and Health coach Mary Kay Tanka was seeking to create an online web presence she could manage herself. Her goals included easy to manage, easy to publish and a fresh modern and professional look and feel. 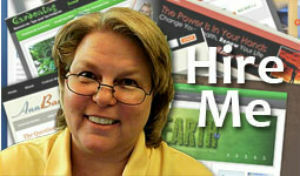 Entrepreneur and chef Maria T Cummins came to me with a site she had created herself using HTML. She wanted to make managing her site easier, and she wanted a polished website to go with her newly designed logo. Since she was opening a new store front, the web presence was becoming more and more important. Entrepreneurs Denis Foley and Carol Hansen decided to add an online business to represent their offline passion, chickens! They selected an Elegant Theme and then we tweaked it to match their specific goals. They really like the large featured image area at the top of the page, and additional advertising space. Entrepreneur and former Pentagon Security Consultant Matt Burgess contacted me about creating a new site for a business he was planning on starting, and a little one on one coaching for how to get it found. He choose the eStore theme from Elegant Themes to allow him to highlight with emotional images, his services. Professional author and Sales training specialist, Ann Barr was looking to replace her old web blog with a new fresh look that was crisp and well defined. She choose the clean lines of True Type and had me customize the look and feel to be more her style.